« Book Passage, Ferry Building S.F. As the NYT reports the phenomenon of e-books quickly overtaking “physical” books, I have been reflecting on the repositories of those old physical artifacts, and the importance of bookstores in our culture — in my life. With my novel debuting in the summer of 2010, I have had the pleasure of visiting many recently. 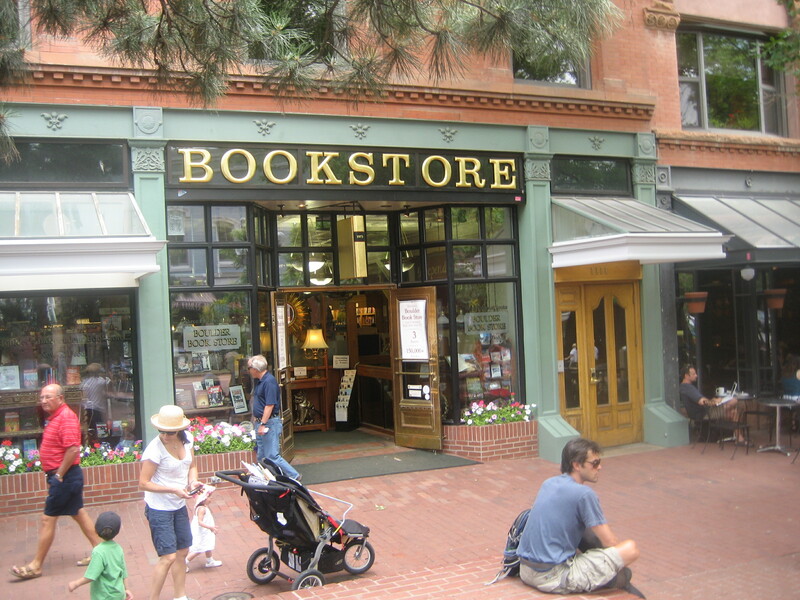 In June, for example, I wandered many times into the incomparable Boulder Book Store, in Boulder, Colorado. Advertising 150,000-plus titles on doors that open onto a tree-lined pedestrian mall, it lures you in with an offer few could refuse. Housed in what seems to be an old mansion, stairs lead up and down, the floors slope and creak, and the stacks are arranged in such a way as to invite browsing — the old-fashioned kind — and lingering. In some corners, comfy chairs add an additional lure to spending time, hours, or days perhaps, pouring over pages. To say this is the bookstore with everything is hardly an exaggeration. Many stores may boast having a killer travel section, a complete floor of children’s books, the newest bestsellers and great audio books, but how many can claim a ballroom? Add to that a literary cafe attached to the main floor, and it’s hard to imagine any stopover in Boulder, a Rocky Mountain haven for sports lovers, that didn’t include some quality indoor time for browsing the stacks, buying books and sipping a latte.